A facilitated strategy retreat to give your team a boost of power and clarity and make collaboration light, joyful and productive. No matter if you form a new team and want to give it a good start, or if you have been working together for decades, give yourselves a rest in everyday’s work to build a strong foundation for your collaboration: Align visions, dreams and strategies in your team. Get to know each others’ strengths and potentials. Find ways to support each other in your individuality. Overcome obstacles in your team with proficient coaches. Have fun with and experiences from other teams around Europe. 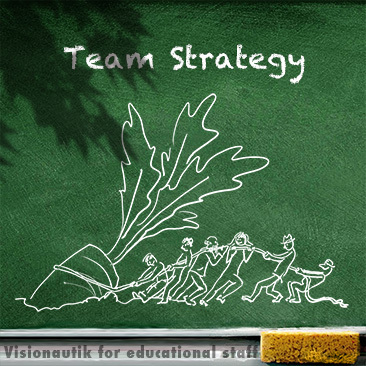 Small teams/departments/project groups of educational staff (max.6 members) with decision-making and management scope. Day 1: Team treasures WS I: Team building exercises & reflexion (trustbuilding within and amongst teams) WS II: Development lines and appreciative resourcing. Evening event: Interactive dinner party. Day 2: Team vision WS I: Envisioning the future: Dragon Dreaming according to John Croft WS II: Making the common vision tangible Evening event: Team collaboration challenge - competing the other teams. Day 3: Team power WS I: Magnetic pictures to reach your goals & rebar bending. WS II: Circular empowerment Evening event: Party of the future with performance, festive buffet and dancing. Day 4: Breakfast, packing, departure.